Yesterday, my youngest son, Craig, and I spent the day fishing the Breeches after meeting my oldest son, TJ, for breakfast. My middle son, Luke, and I fished for a few hours on the Falling Spring today. You might say it was a father-son weekend. 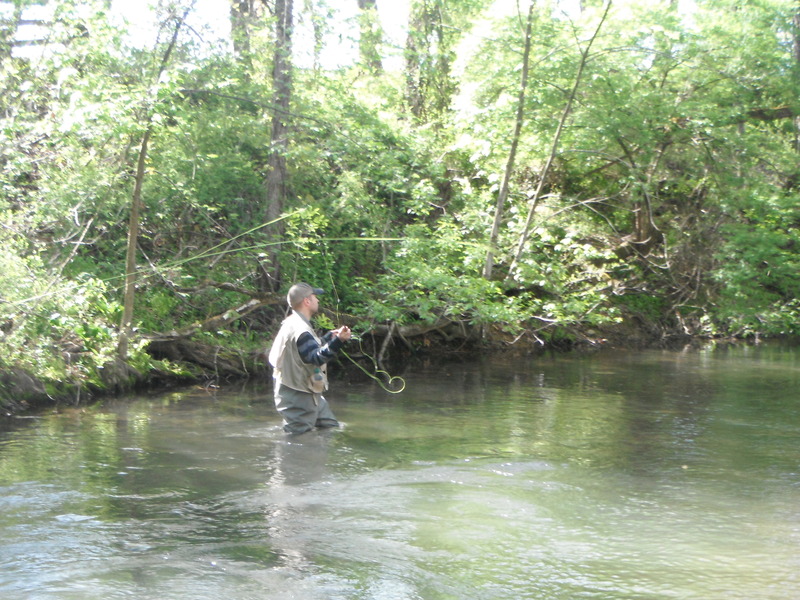 I cherished the days spending time with my Dad and Granddad (growing up) and mostly fishing the Conococheague Creek. Even though we used garden hackle (worms) back then, my Dad taught me how to read the water and how to enjoy myself along a trout stream. He also taught me important things like trout stream ethics and to not trash the stream. It was also a tradition to cook out along the stream on the first day of trout season…..what great memories! I owe my passion for fishing to my Dad, so I’ve tried to give this same opportunity to my sons as well. TJ is the least passionate of the 3 boys, but when he does go, can cast as good or better than any of us. Sickening! He is also the only “techy” in the family and helped me set up my blog. Thanks TJ! As far as the fishing goes, Craig and I caught a dozen wild browns on the upper section of the Breeches using Caddis and Parachute Adams. In the regulation area upstream from Allenberry Playhouse, we caught a handful of fish on #28 midges. There were Caddis and a few Sulphurs in the air, but the fish were tuned in on the small stuff. The Falling Spring was not much different, as when we found fish rising with any consistency, they were sipping midges. We did each manage to fool a couple with Caddis. Each week keeps getting better, so stay tuned for the next adventure. Nice post. My youngest daughter graduates from Millersville on the 18th…..after that, I’ll get a license and we’ll pick a day for us to try our luck. I will look forward to it Jim. You and I are on the same wavelength. Can’t wait see you at Pine Creek.